Home » Website Building » Make Money Online » How to Setup Auto Ads in Google AdSense? How to Setup Auto Ads in Google AdSense? 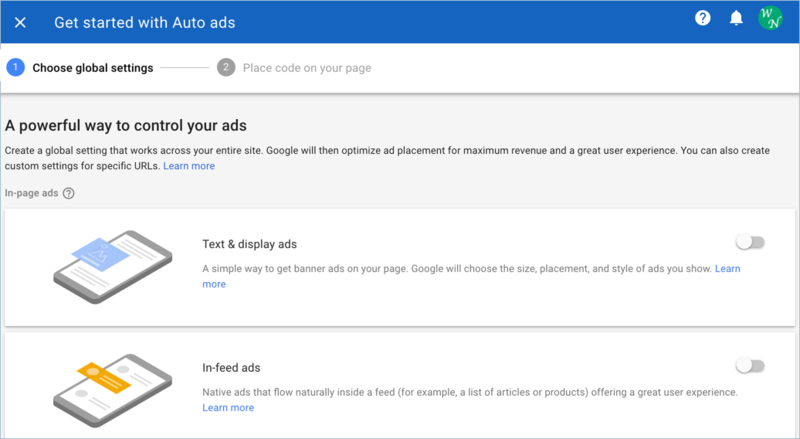 Auto ads is the latest AdSense product from Google. This is much different than any other previous ad formats or improvements for AdSense publishers. As of now publishers need to choose different ad codes for different formats and insert in appropriate places on their site. This is a good option for those who have lot of time for analyzing the placements and work on optimizations to improve the click through rate. But spending more time on monetization will impact the time spend on creating quality content. Now that Google has come up with Auto ads to make everything obsolete. In this article let us explore more on how to setup auto ads in Google AdSense account and other important factors. As the name indicates, you don’t need to worry about placements and sizing any more. Just insert one piece of ad code on the header section of the page and Google will take care of the rest for you. If you are already using page-level ads for mobile then just activate the auto ads in your AdSense account. 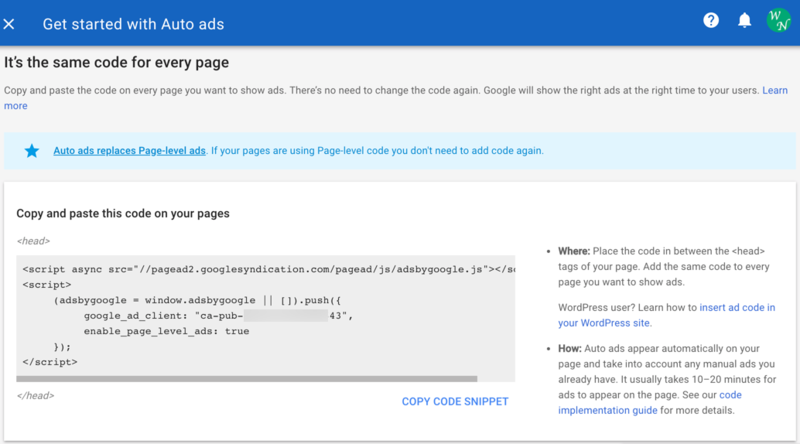 Google uses the same page-level code for auto ads; hence all enabled formats of ads will start showing on your ads. Google does the analysis of your site offline and serve best-fit ads in terms of placement and revenue. This essentially means, Google will find the placement on your pages automatically and serve the highest paying ads. Also the page speed of your site will not get impacted due to enabling auto ads. You can try auto ads with the existing ad codes. This will help you to try out the best option suitable for your need. Enable or disable the required format of ads from AdSense account. Auto ads can be applied globally on your account level and then customized to individual URL level if required. How to Setup Auto Ads in Google AdSense Account? Login to your AdSense account and navigate to “My ads > Auto ads” section. Click on the “Get Started” button on the message showing like below. Choose “Automatically get new formats” option if you want auto enable new formats for auto ads. Once decided the formats, click on the “Save” button and get the ad code. Place the ad code between the header sections of all your pages. When you have sites on content management systems like WordPress, just insert the ad code in “header.php” file. In few minutes, you will see the ads will be shown on your site. Once enabled, all the sites on your AdSense account will start showing auto ads. If you want, you can customize the setup for different URLs. 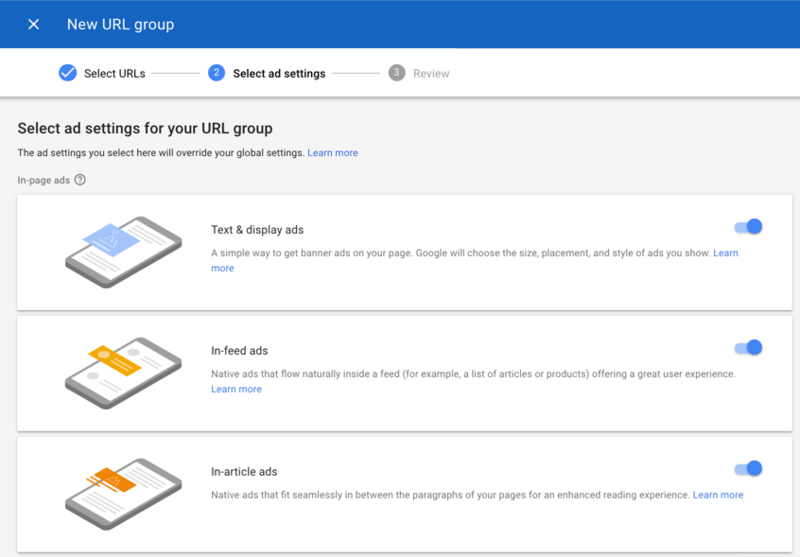 Go to “My ads > Auto ads” section and click on the “New URL Group” button. 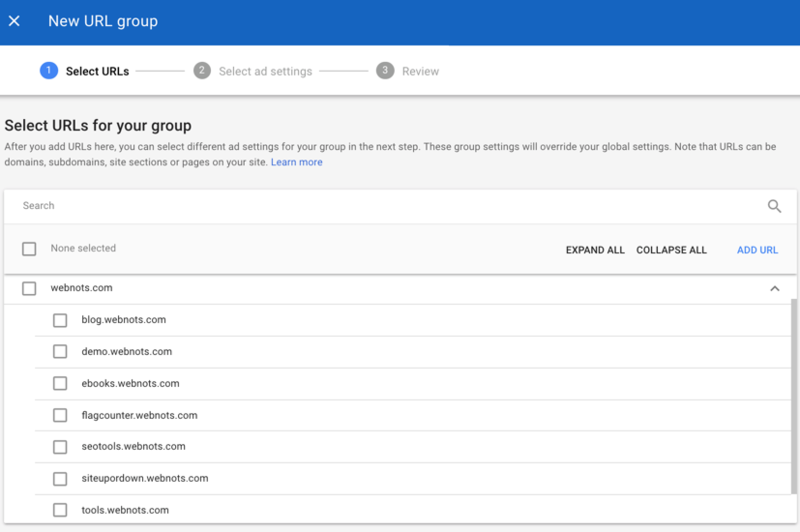 Google will show all sites and subdomains on your account. Choose the sites or domains you want to customize. You can also add individual URLs by clicking on the “Add URL” button. Choose the format of ads to be shown on the selected URLs. Turn off all formats if you want to disable auto ads on the selected URLs. Save your changes and the URL group will act in different manner compared to the global settings. Google also made the reporting in easy manner to find how your auto ads are performing. 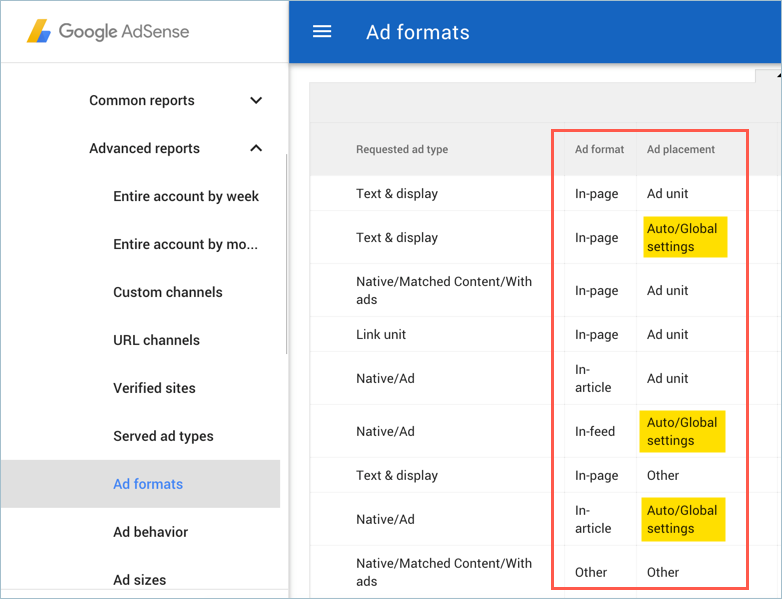 Go to “Performance reports > Advanced reports > Ad formats” section. Here you can see the performance of individual ad units and the auto ads from global or custom settings. Will the Revenue Increase with Auto Ads? We have tested auto ads on two of our sites with two different scenarios. Enable Auto Ads Keeping Existing Ad Units – this resulted in getting more than 15% increase in revenue. Enable Auto Ads and Remove All Existing Ad Units – this result in almost 10% decrease in revenue. So based on our experiments, we recommends to use auto ads along with your existing ad units. For example, you might have inserted ad units on fixed places like below title, after post content, middle of the sidebar, etc. But you may not have any ad code inserted in-between the page content. By enabling auto ads, there will be ads automatically shown in-between the content thus increasing the overall revenue. On other hand, removing the fixed ads may lead to lower revenue. This is because, Google will struggle to find correct placement on your pages with machine learning technology. For example, Google shows the recommended content below the footer layout and even auto ads are shown in-between related posts links on the footer area. These all will only have negative impact both from user experience as well as revenue. So place your fixed ads on prominent places and leave in-between and in-feed ads for auto ads. This will act as a good balance and result in more revenue. What Auto Ads Not Support? AMP and non-AMP pages are different. You should insert separate ad code for your AMP pages. You may get lower revenue when trying with ad codes from other programs. Don’t enable auto ads if you are using ad codes from other programs on the same pages. Auto ads works on responsive sites. Upgrade your non-responsive sites if you are still holding to fixed layout sites. Auto ads may interfere with the floating menu. So you might need to disable if you use floating menu on your sites. Though page speed is not impacted with auto ads, it does not improve either. Auto ads are really a game changer in pay per click advertising world. It is not perfect at this point of time and looks like mix of page-level ads and publisher’s plugin offered earlier. We strongly believe Google will do more and more improvements in terms of placements and serving correct ad formats over period of time. So forget your worries about where to place and what to place, just focus on creating content for the users. Which type of ads generates the most RPM? Page ads, or In-article ads? How about ads balance? Auto ads slows down my website. To me, its a useless feature introduced by Google. They should add a simple on and off button for auto ads. There are publishers who still don’t know what the heck auto ads made for.